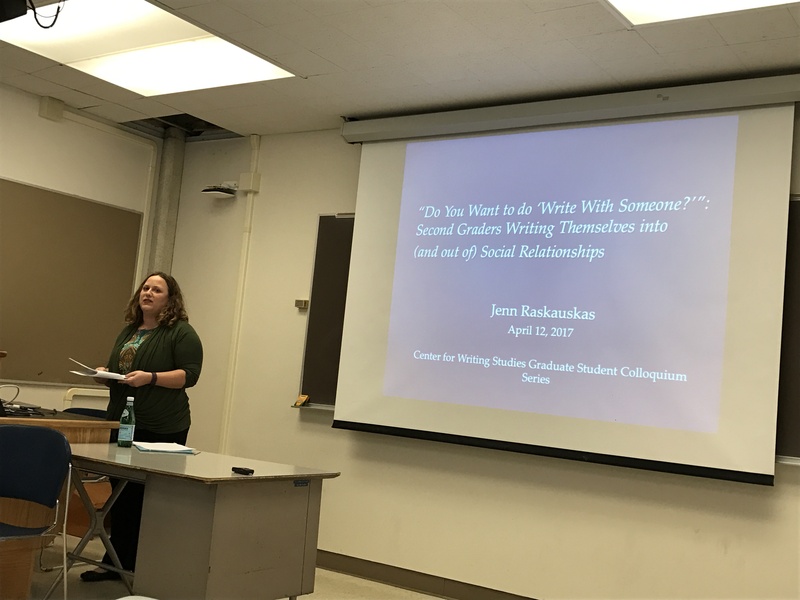 Katrina Kennett and Jenn Raskauskas shared their dissertation projects as part of the Graduate Student Colloquium Series. Katrina’s work focused on how historical views of teachers’ planning practices currently relate to teachers’ actual preparation. Through analyzing three diverse teachers, she found a common thread amongst them. The teacher’s practices and reflections readily support her position that teachers’ planning is shaped by more than curricular demands. For example, when a kindergarten teacher saw snow cones on a summer day, she connected it’s form to a stomp rocket which led her to imagine using snow cones as stomp rockets for as a collaborative STEM project with a 5th grade class. Although the project had a simple beginning, the process of planning the lesson had more complexities than traditional frameworks of planning have supported. Her presentation also highlighted the uncertainties of planning. A high school English teacher included instructional time in the unit without complete plans. These “flex” days allowed him to best accommodate his students’ needs for the project. He was intentional in incorporating open times because he anticipated that his plans may not encompass all that students’ learning trajectories may entail. 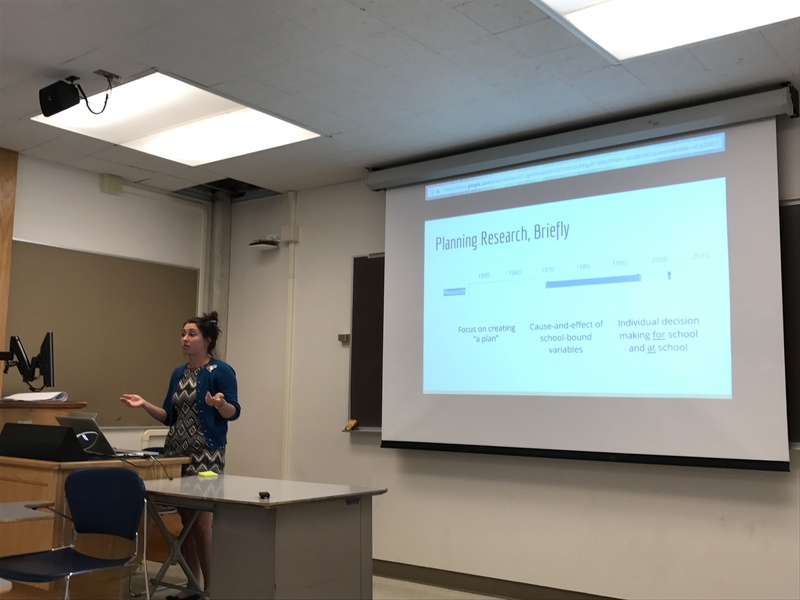 Her presentation of the dynamics within teachers’ planning practices was insightful and thought-provoking as it expanded traditional notions of all that encompasses planning. Jenn opened with the trending tweet #ThanksForTyping that highlights how women were unnamed when frequently thanked by their husbands for typing manuscripts. This current theme is relevant to the larger conversation about ownership and how writers make decisions to recognize people who could be considered influential in their writing. She then articulated her data of second graders’ writing practices to analyze their perceptions of ownership through collaborative writing. When the two boys wrote "6 Reasons Why Donald Trump Shouldn't Be Elected," one partner, Jack, wanted to use "cuss words," but his partner, Oliver, said: I say bad words, not cuss words, okay? So when Jack encoded the idea he made a compromised word choice and wrote "curse words," taking into consideration his partner's objection to his original word choice. The students that she observed also displayed ownership in various ways. For example, one pair of students viewed shared writing as composing every-other sentence and both students names’ were listed as authors. In a different situation, a student whose original partner wasn't present when the class was sharing co-composed writing, chose to share a peice she had written by herself rather than sharing work she had written with someone else on her own. By reviewing elementary students’ practices, Jenn was able to assess how students view their writing in collaborative settings. 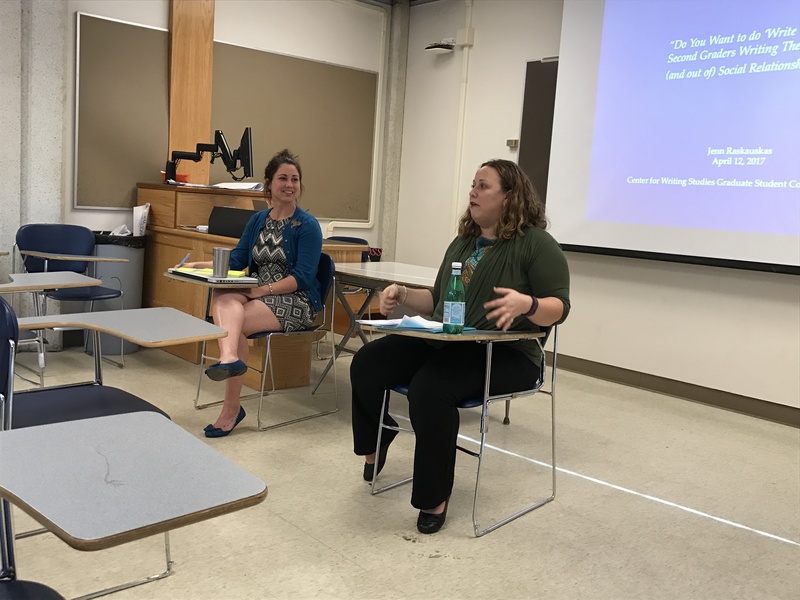 The closing question and answer session was helpful as both researchers shared their reflections on the process of synthesizing data and the importance of the support of their teaching communities. The discussion generated a positive discussion on their excellent work.